How To Choose The Best Acoustic Guitars? You don’t need to be a guitar expert to choose that guitar in your dreams. What you need though, is to know first, how a guitar could be awesome in many ways and second, the type of awesome you want it to be! There are many factors to consider in choosing a guitar. Each brand, size, shape, material, and a lot of other things that we'll be discussing later contribute to the iniquity of this musical instrument. No matter what you do, do not ever buy a guitar on impulse, because knowing the differences in guitars thoroughly would make you choose the best acoustic guitar. It may not be the best for everybody, but if you choose well, it would be perfect for you. Read on and each word will bring you closer to that dream guitar. No, the best guitar in the world hasn’t been discovered yet. But the best one for you is already out there. So, how does this exactly help you in choosing the best acoustic guitar? Each factor to consider is summarized well in a manner that is understandable to both experts and laymen in the music industry. Brace yourself, for you're in for a treat. You're about to see the top rated guitars both in quality and affordability out there in the market. Get to know them and how each one is made, you'll definitely find the right one for you. Guitar manufacturers use a wide variety of wood, equipment, and design elements, to create each guitar model. Get to know how each one is made, because whether you believe it or not, one is crafted from your imagination. There are so many choices to make in choosing a guitar, knowing what each is would help you make wiser decisions. Here are some factors that you need to consider before you go on the lookout for your upcoming dream guitar. What sets experienced guitarists apart from beginners is their specific taste for factors such as tonewood, soundboard, and other guitar construction details. They’ve been with their own guitar for quite a long time now, and if there’s something else that they want, then they’d look at these things. They also require guitars made out of materials with better quality to match their skills. Beginners on the other hand may not be so willing to spend a big amount of money for learning and mastering guitar playing. Each guitar brand, string, and material, contributes to the birth of a unique sound. What if a high-calibre guitar is really good, but doesn’t match the guitarists’ style? A good guitar doesn’t always have to be expensive. In fact, here is a list of affordable acoustic guitars of good quality. Are you a beginner? Don’t forget to check this out and discover what you like. We’ve listed five top-rated acoustic guitars for beginner in the next part of this article; you can read right now here or continue reading. 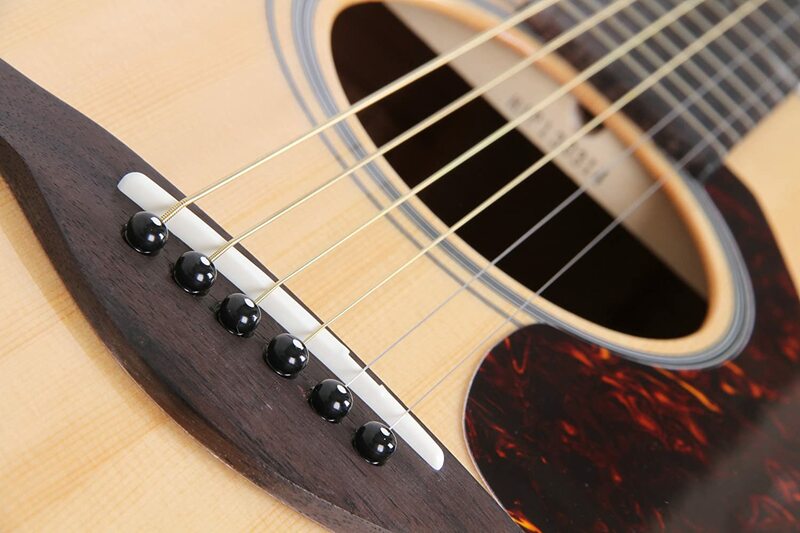 Choosing between an acoustic-electrics guitar and a traditional acoustic guitar is an important decision. The main difference between them is that an acoustic-electric guitar is equipped with accessories for connecting to a power supply and other electronic devices, empowering the guitar to make louder and stronger sounds. You can connect it with an amplifier or computer and record or hear the reproduced sound from the guitar. A good acoustic-electrics guitar may costs twice as much as a similar traditional acoustic guitar. Of course, there are cheaper ones, but the sound quality is not good, both when plugged and unplugged. As a beginner, you’ll mostly likely use the acoustic guitar for learning and practicing, so the electrical functions may not be used regularly. The third reason is a personal preference. I personally prefer the pure natural sound from a traditional acoustic guitar. It could be different for you too, but I like how natural an acoustic guitar sounds. So that’s another factor to consider. What do you like? Acoustic guitars come in a variety of sizes and shapes, from small sizes (for kids) to classics, jumbos, and dreadnoughts. In an acoustic guitar, the body style determines the sound and tone projection. Tonal quality and comfort when playing are effects and important to consider too. There are acoustic guitar bodies that come in a single or double cutaway design, thus giving easier accesses to the upper frets. If you care less about these factors, you may also think of usage. Will you be carrying your guitar around town? Maybe a smaller guitar would be more portable. Try the guitar out in the music store. Try playing it while sitting and standing. If it isn’t comfortable, I really suggest choosing another one, but that mostly depends on your priorities. For the neck, the most important thing to consider is the size of your hand. Generally, the width and thickness of the acoustic guitar neck is based on the size of the body and number of frets the neck has. A normal acoustic neck made of about 12 or 14-frets. Intonation determines whether the notes played are in tune as you move up and down the neck of the guitar. If the distance between any of the frets is off, the acoustic guitar will be unable to play in tune. The type of wood determines the sound and tone of an acoustic guitar. Most guitar manufacturers assume that the top quality wood product produce the best tonal quality. As a result, the costs of acoustic guitars increase dramatically in line with the rarity of the tonewood. However, recently, because of the decreasing supply of some tonewoods, they’ve found alternative materials to create affordable guitars with the same sound quality. Another important element is the type of tuning machine in the guitar. Tuning machine helps you find the right tune and hold pitch. Enclosed machine heads can resist airborne corrosives and rust, and therefore does not require as much maintenance as opposed to an open tuning machine. If you’re a keeper, you know what you want. Bridge and fingerboard materials do affect the acoustic guitar’s sound, but this is minimal in comparison to the body. It’s really act best to try and go to the guitar store to see how the guitar sounds with the totality of all the factors mentioned. But don’t forget to remember each guitar’s unique sound, materials, and structure because that knowledge would help the next time you buy a guitar. 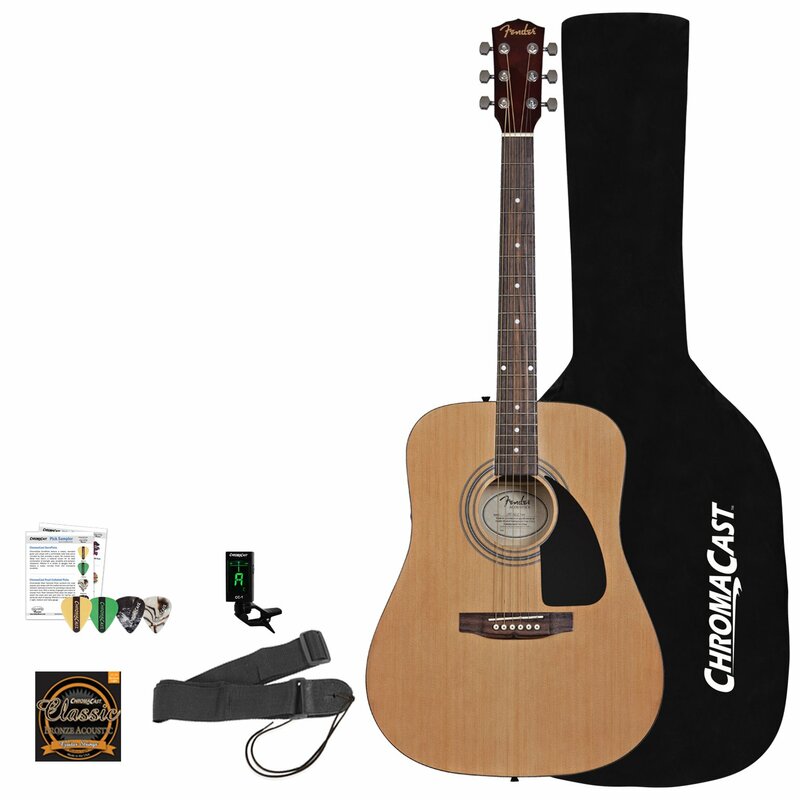 "This is the 1st acoustic guitar model I will definitely recommend for beginners." It's the first model in the Yamaha FG series that has been in the market for more than 50 years. The FG series is a perfect example of the unique combination of classical design and modern guitar building technique. This series' production is focused on the goal of creating great tone and an outstanding playing experience. The FGs are the choice of many famous guitar players. 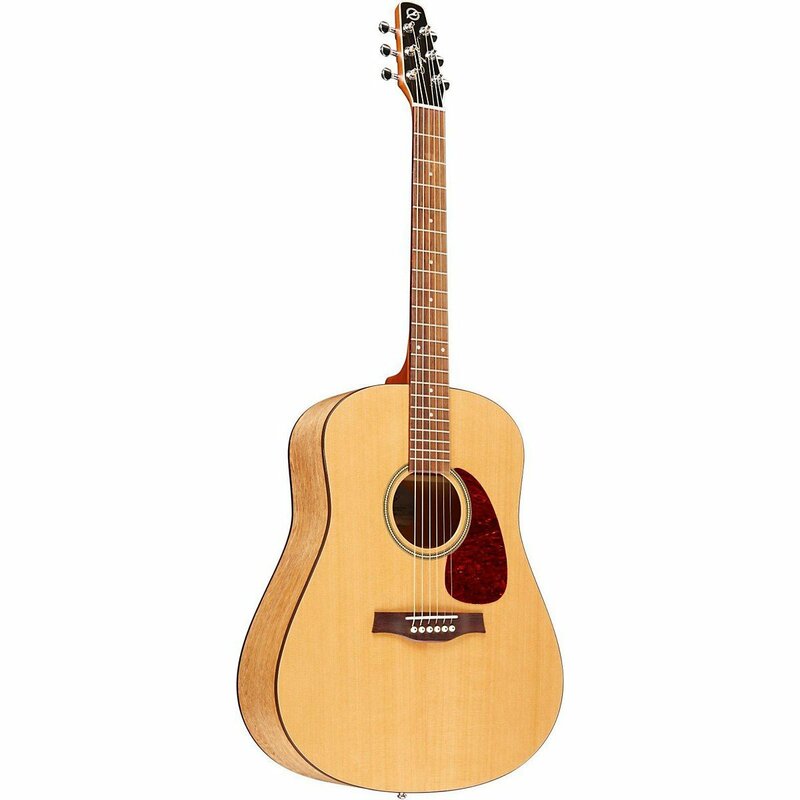 The FG700S consists of solid Sitka spruce top, rosewood fingerboard and die-cast tuners. It features a black-and-white body binding with a tortoise pick guard. Watch the following video to see this guitar in action. Check how the sound and tone suits your taste. It is a full-size dreadnought style body guitar that gives a full and vibrant tone. It has a rosewood bridge, and a rosewood fingerboard with 20 frets and chrome tuning. According to most recent customer feedbacks, the Fender is lightweight and can fit comfortably on anyone's hands; it sounds great and has an excellent tuner. You may want to watch the detailed review video here. 2. It's light! I don't know anyone who likes carrying a heavy guitar around. This is an elegant grand orchestra-styled acoustic guitar that offers a rich, well-balanced sound. With a graceful Venetian-style cut. The Jasmine S34C Nex is great for all guitar players who are seeking a well-built and easy to play guitar. It features a select spruce top with Advanced "X" Bracing technology from Jasmine, and sapele back and sides. The full 25.5 inches slim neck provides a comfortable feeling and great playing experience. Its smooth satin finish boosts resonance for the best sound quality. 1. It plays a BIG SOUND for a small price. It's great for beginners and casual play. 2. The guitar's shape is unlike the first two. It makes the sound richer. You can listen to the review video or see the guitar for yourself to know how body shape affects sound quality. "The Seagull S6 is the most popular Seagull’s model so far." ​It comes from the Seagull's original series and offers traditional craftsmanship combined with today’s guitar manufacturing techniques. Some features of Seagull S6 Original include a a pressure tested solid cedar top with a semi-gloss custom polish finish, a double action truss rod, a Canadian wild cherry for the back and sides, a rosewood bridge and fingerboard, a compensated Tusq Graptech nut and saddle, a silver leaf wood integrated neck, and a sound preview video. The Seagull S6 is at a higher price range compared with the 3 aforementioned models, but we're not just talking about prices here. Some guitars offer value for money, while investing more money for a better sound is good too, right? What sets each apart is the buyer's goals and purpose. 1. It's made of high-quality materials for a reasonable price. The pressure-tested top is really worth the investment, especially for careless people (like me). 2. It produces a rich mellow sound and that's exactly my style! Taylor Guitars is a relatively new guitar manufacturer that has been founded in 1974. Regardless of its young age, they have evolved into one of the world's best guitar manufacturers. Being popular for combining an innovation of modern technology with a master craftsman's technology, Taylor's Guitars are considered among the best sounding and easiest to play guitars in the world. The Big Baby is the most popular model in the Baby series; it's generally a great-sounded and easy to play guitar in the medium price range. Although the Taylor Big Baby has a smaller body than most full-size acoustic guitars, it provides an incredible sound. "While it maintains to be traditional, the Big Baby offers a perfect playing experience." It's made of excellent materials and technology, thus has excellent quality. Taylor's production standards are among the best in the guitar industry. 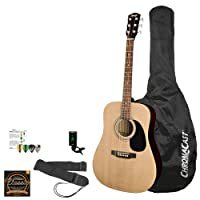 It provide top sound thanks to the solid Sitka spruce top and it also comes with a free gig bag, which is well-made and great for traveling around. 1. The sound quality is exceptionally good. For sound quality, this has to be really one of my favorites. 2. The spruce top is phenomenal. One of the best among the guitars that I've seen. If you're after aesthetics, this is really a guitar to consider.